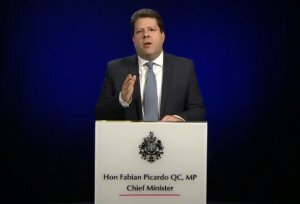 As European leaders resolved a last-minute dispute over the rock of Gibraltar on Saturday, clearing the way for a summit to approve a deal on Britain’s withdrawal from the bloc, Gibraltar’s chief minister, Fabian Picardo, compared the Spanish Prime Minister’s tactics to those of Spain’s late fascist dictator Francisco Franco. Spain’s Pedro Sánchez withdrew a threat to boycott Sunday’s Brexit talks just hours before Britain’s Theresa May arrived in Brussels. In his letter formally inviting the leaders of all 28 EU member states to Sunday’s summit, Tusk said the deal reduces ‘the risks and losses resulting from the United Kingdom’s withdrawal’. Ahead of May’s arrival, however, diplomats had scrambled for an unexpectedly intense final round of discussions. Then Britain issued a statement saying it would continue bilateral talks with Spain after Brexit on 29 March 2019 – and Sanchez relented. He claimed Britain had given ground, saying both countries ‘are going to have to talk about co-sovereignty’. According to Tusk’s letter, the withdrawal agreement protects citizens’ rights and the Northern Ireland peace process, while ensuring Britain will keep paying EU dues during a transition period. Alongside this, EU leaders will also approve a short political declaration Tusk said would act as a roadmap for negotiations after Brexit to ‘build the best possible relationship with the UK’. He emphasised that ‘at this critical time, the EU27 has passed the test of unity and solidarity’. In legal terms, Spain’s disapproval would not have halted the divorce settlement. Sánchez insists that Madrid holds a veto over the fate of Gibraltar, a rocky outcrop home to a port and around 30,000 people, in post-Brexit negotiations. ‘For the withdrawal negotiations, given there are some circumstances which are specific to Gibraltar, we held talks with Spain which directly involved the government of Gibraltar,’ May’s spokesman said. Any future relationship negotiated between London and Brussels will have to be approved by all remaining member states – giving Spain a de facto veto further down the line. But May insists she will continue to negotiate on behalf of the ‘entire UK family’ including Gibraltar. In an angry televised statement, Gibraltar’s chief minister, Fabian Picardo, compared Sánchez’s tactics to those of Spain’s late fascist dictator Francisco Franco. ‘We do not need to wait until the start of the talks,’ he declared. A European source said the published minutes of Sunday’s summit meeting would include language stressing the importance of Britain maintaining a level playing field for business during the 21-month post-Brexit transition. The summit will also give the European Council the lead over the Commission in negotiating future ties – in part to reassure Madrid that its voice will be heard before any final settlement. Many of her own Conservative MPs oppose the deal, as does Northern Ireland’s Democratic Unionist Party (DUP), which props up her government. At the DUP’s annual conference in Belfast on Saturday, May’s former foreign minister Boris Johnson said the Brexit deal was a ‘historic mistake’. ‘The Titanic springs to mind and now is the time to point out the iceberg ahead,’ he said.